Slippers make the whole body feel a bit warmer on a cold night (or day!) and that goes for the littlest members of our families too. 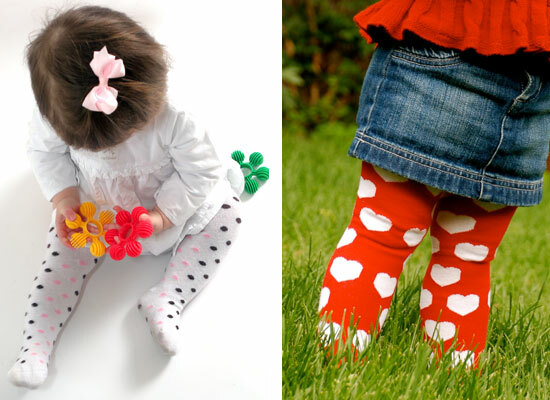 Come on through to find out our top ten ways to keep little feet warm this winter. 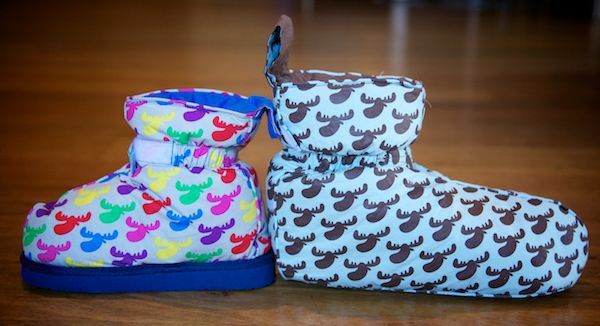 Who can go past the upcycled beauty of these gorgeous boots from Wooly Baby? There are lots of different styles to choose from, and they’re all individual. Just like a warm jumper for your feet – prices start at US$32. Feet that need some serious insulation should look no further than these serious footwarmers from Blu Moose. 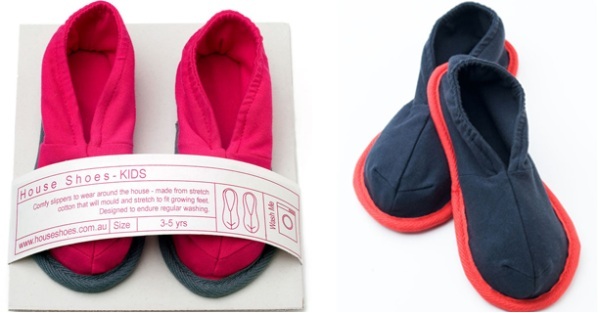 They’re machine washable and you can even buy them with a lightweight sole so you don’t have to take them off in bed! Children’s boots are $24.95 and they come in adult sizes too. 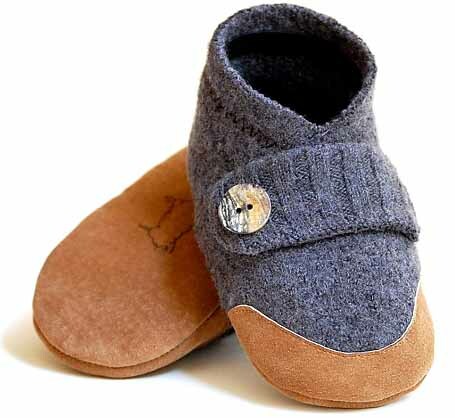 These stylish and durable felt slippers from Pia Wallen tick all the boxes! 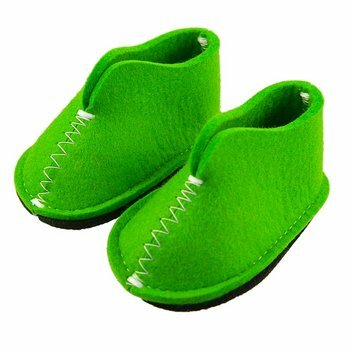 Those Scandinavians sure know how to keep the feet warm in style – there are six colours in the range of baby slippers from Pia Wallen and you can pick a pair up for €36 (about $50) plus postage. OK – I’m stretching the category a bit here because these aren’t slippers, they’re socks. In fact they are Pork Chop kids’ socks, and while they look just like tights they’re actually thigh-high socks. Why is this great? Because if you have a child in nappies, you’ll know how maddening it can be to take tights on and off all day every time you have to do a nappy change. There are a great range of designs and you can get them for $16. 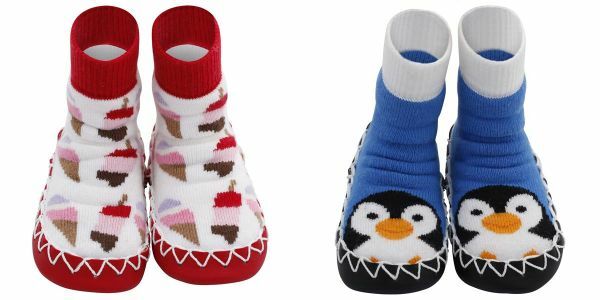 These delightful animal slippers from Sew Heart Felt have some proper eco-credibility. Not only are they seriously cute (woodland creatures seem almost made for children’s feet) but they are handmade by women in Nepal, providing them with ongoing sustainable employment. There are lots of different styles available – your only problem will be choosing which ones. They will set you back $40.75 plus postage. Are they slippers? Are they socks? Well, actually, they’re Moccis, and they’re the best of both worlds. The Swedish who designed them call them “indoor shoes” and they have it all – durable, comfortable, great designs, non-slip leather soles. What’s not to love? The children’s sizes start at $39AUD (plus postage) and yes, they come in adult sizes too. These ones are similar, but French. Collegien slipper socks have an anti-slip PVC sole with two great benefits – firstly, if you find your child has somehow snuck outside and landed in a puddle, the slippers won’t be ruined; and secondly, you can throw the slippers in the wash. What’s more, their price has actually come down since we first spotted them, and you can now buy them in Australia for $35. The super snuggly House Shoes come in sizes to fit kids aged from three to eight, and they look so comfortable I’d like a pair myself. Their foam sole means they’re easily squished up to take anywhere and their stretchy cotton finish makes them comfortable even if little feet have a growth spurt! You can get your kids’ feet into a pair for $34.95. 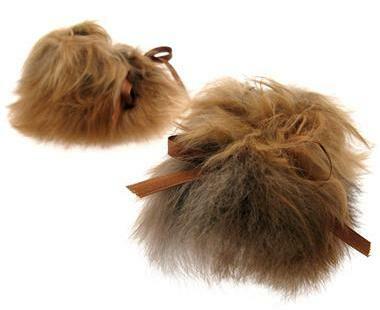 Let’s end on an irresistibly cute note – the beautiful Yeti Booties from designer Samantha Holmes. No, in case you’re wondering, they’re not made from real yeti, but rather from the very warm wool of the alpaca. They come in brown or white and they’re certainly something special (and warm!). They’ll fit babies up to six months old and you can get them for $50 (plus postage from the UK).